Most of you know this, and follow this, but I still want to share it with you all, 'cause I just love the pages I have bookmarked. 1. Apps // This bookmark is by default. 2. Hathway // Well, that is my Internet connection. I have to log in, and only then I can get an access to the Internet. 3. Blogger // After the Hathway bookmark, this is the first bookmark that I open. I open it, think of a topic, and then begin writing (and also take regular breaks). 5. FB // I hate to call Facebook as 'FB', but I had to write FB here, due to space constraints. This is the second tab I open immediately after opening the Internet. And as I am always signed into all the accounts on my computer, it makes the whole bookmarking process fruitful. 6. Free Movies // This is where I watch movies or TV shows through live streaming. I owe a lot to this site. 7. Torrent // You can search a movie's availability instantly if you bookmark the Torrent Search Engine. 8. AFC // The full form goes as Arsenal Football Club. If I have to check for updates or news, I open this bookmark. And again, the bookmark's name is AFC and not Arsenal due to the space issue. 9. Instagram // Sometimes you get bored hitting the refresh button again and again on the Instagram app. This is when you can open Instagram's website version, and take a look at the missing pictures. Though this site doesn't allow you to check the followers and few other features, it still can help you stalk those girls. 10. Images // It is seriously annoying to open Google, and then click on the Images, then type whatever you want, and then hit Enter. So, I bookmarked Google Images itself, and renamed the bookmark as 'Images'. 11. YouTube // If One Tree Hill's current season is over, and the next season is yet to come to me, and there are no movies that I haven't watched, I simply go to YouTube and watch videos. The videos vary widely. 12. Twitter // In between, I used to post inspirational sayings/quotes on the blog's Facebook page. I usually copy-paste these sayings/quotes from twitter. And if I'm on the computer, and I have to tweet about something, I don't tweet it via my cellphone, but via the Twitter's website version. 13. Thesaurus // An online dictionary and a heaven for me. 14. LetsIntern // I knew I wasn't available for internships this summer, as I'm flying to China (!) soon, but anyway, I applied for four-five positions. I got responses as well. There are rankings to every student/employee on this site, and I didn't want to be ranked lowly, so I have bookmarked it, to check the notifications. This is the only way for me to get internships, and so, I'm sort of serious on it. 15. Downloads.nl // This little site has almost all the possible songs. If I have to download a song, which I couldn't find anywhere in the music stores, I take the help of this site. 16. shoes // I download ten pictures of shoes, and save them in a 'Shoes' folder on my computer. Later, I upload them on the blog's Facebook page under the album 'Shoes Maniac'. 17. quotes // Same goes with this bookmark; but only the folder's name is 'Quotes' this time, and I upload it under Facebook page's 'Sayings'. 18. summer // Well same thing here. These are the summer outfits, which go by the name 'Outfit Ideas' on the page, and are saved under the album 'Outfits' on my computer. Apart from this bookmark bar, there are several other pages that I have bookmarked. These are some of my favourite bookmarks. I cannot link all of them, but if you want their links, I'll surely post them for you. The reason why I haven't renamed these bookmarks to an appropriate one is because they are hidden (i.e., not seen on the bookmarks bar). 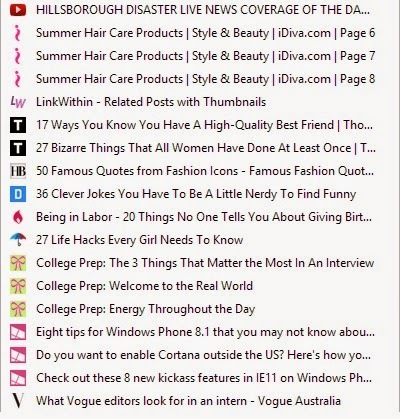 Do you bookmark pages like crazy?